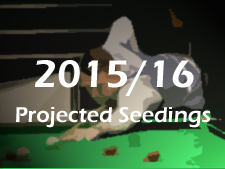 Last season at the Crucible it was announced that there would be a format change for the 2015 World Championship, with the field extended to 144 players to encompass former world champions and a selection of other invited players at the discretion of the WPBSA. Today it has been announced that one of those players will be ten times ladies champion Reanne Evans, who like all of the other names in the draw ranked outside of the world’s top 16 will now have to win three qualifying matches at Ponds Forge, Sheffield in April, if she is to make it through to play at the Crucible Theatre for the first time. 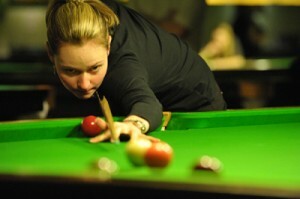 It will not be the first time that Reanne will have competed at the World Championship qualifiers, having lost in the pre-qualifying rounds to Sam Baird back in 2011 at the end of her maiden professional season, but this time she will be sure to meet one of the professionals in her opening round match. Her selection also follows her landmark victory against Thepchaiya Un-Nooh at the start of the season to become the first woman to compete at the venue stages of a world ranking event, losing out at the wildcard round of the Wuxi Classic. Win or lose, it is good to see Reanne’s achievements recognised in this way, not just for her personally, but for ladies snooker as a whole which will hopefully continue to grow in the coming years. 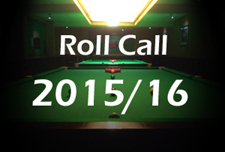 Read Reanne’s reaction here at the BBC website and more here at World Snooker. Fantastic publicity for the tournament. I hope the WSA issue a list of accepted invites in the coming weeks. I can see 123 main tour entries (all but Hendry, Abumdas, Ju Reti, Rouzi Maimaiti & Clark. Which means 21 invites (currently only Evans, Itaro Santos, plus any of half a dozen living ex champions are confirmed). Be great to see invites too for Yan Bingtao, Zhu Yinghui, Alex Pagulayan, Lukas Kleckers and Kacper Filipiak.